So you want to stream stuff to your TV. These days you have plenty of options, but which of them is best? After Roku announced its upcoming $50 HDMI-ready streaming stick and Amazon trotted out its new $100 Fire TV streaming box, we put this chart together to show you how it stacks up to the competition. It turns out that you really don't have to spend that much money to get all of the goodness of streaming videos, music, and plenty of your apps up on your television at will. 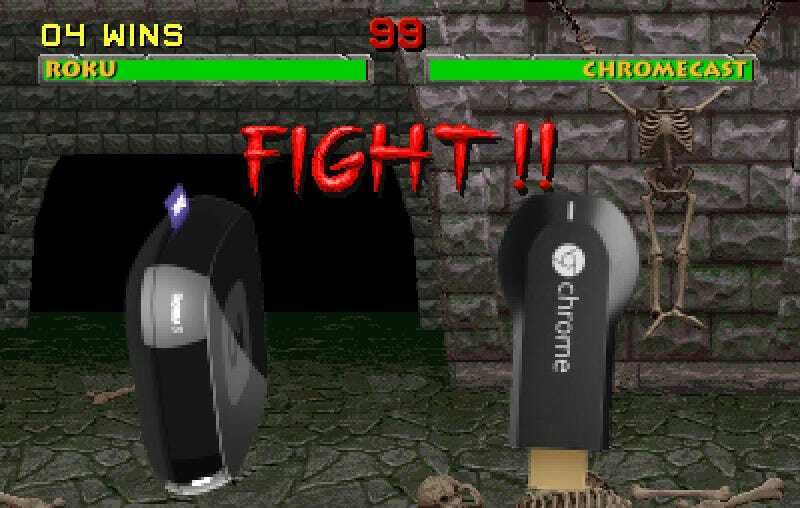 Available now, the Roku stick beats out fellow budget pick Chromecast for a number of reasons. One, it carries more apps that you want, like Amazon, Vudu, and Showtime. Sure, Chromecast will keep adding partners, especially now that Google has opened up its developer SDK, but who knows how long you'll be waiting? For just $15 more on the Roku, you not only get 1000+ channels, but a remote with which to navigate through them. Yes, you can use your phone to do that with other boxes and dongles, but some folks just want a good ol' fashioned clicker. The Amazon device, meanwhile is $100, and though you're paying more for the speed of its quad-core processor, as well as gaming features, you might not even care. If you're a gamer, you've almost definitely got something better. Fire TV, disappointingly enough, lacks HBO Go and Vudu. You could also make an argument for the Roku 3, but it comes with a lot of features that most people really won't use, like a headphone jack for private listening and the ability to play Angry Birds. There's nothing wrong with that, it's just a lot more money for a little more use. Yes, if you're a gamer you should look at Xbox or PS4. And if you're deeply, deeply invested in Apple's ecosystem, Apple TV is more than worth a look. But for pure streaming for your buck, the Roku Streaming Stick seems like your best bet.